Claustrophobia is defined as "a fear of being in a confined or enclosed place". We strongly believe that by understanding the MRI procedure, many "claustrophobic" patients realize their fears can be minimized. It is, however, somewhat confining, so if you are very nervous, we do have alternatives available. First we will thoroughly explain the procedure, and then discuss alternatives for helping you relax. We've developed a program that combines counseling, education, and therapeutic techniques. Oftentimes a person battling claustrophobia is able to comfortably complete the study and get the quality diagnosis they need without the assistance of pre-medication. After you arrive at the center you will sign consent forms. We will copy insurance cards and collect any outside images you may have brought with you. Then the technologist will explain the procedure to you. You will be asked to remove anything metallic (jewelry, eyeglasses, watches, etc.) and change into a hospital gown if your clothing has metal zippers, snaps, hooks, etc. Your personal belongings will be stored in a secure locker during your scan. The technologist will then accompany you to the scanning room and help you get situated on the table. During the scan, you will lie on the padded table on your back with a cushion under your knees. The cushion helps take the pressure off your lower back and allows you to be more comfortable. You will also be offered earplugs or earphones to listen to music during the scan. You can choose from a variety of CDs, which we have here, a digital music channel, or bring your own CD. The table then lifts up and slides into a tube-like cylinder that is flared, wider on both ends. It NEVER closes. It is open the whole time on both ends. There is a fan and a light inside. You typically go in headfirst with your head near one opening. If you look above, you can clearly see out one end. If you look down towards your feet, you will easily see out the other end. More than likely the lower part of your body is out of the scanner altogether. Alternatively, if we perform an MRI of your foot, knee, or leg, you would go in feet first and your head is outside the scanner. Most often, however, the best imaging is obtained by going in headfirst. Either way, the technologist will be able to see you throughout the entire scan and will talk with you over the headphone/intercom system. Although it is important that you are able to lie still for about 30-45 minutes, the scan is actually divided into numerous sessions ranging from one minute to 6-8 minutes in length. In between these sessions, it is okay to move about a little bit while remaining in the same position on the table. During the picture taking, you will hear a repetitive knocking noise. Nothing moves or touches you and you will not feel any discomfort-it's just noisy. The headset with music helps muffle this. The technologist will talk to you over the headset intercom and let you know when they will start each group of pictures and how long they will last. Ask the technician to adjust the volume of the earphones if needed. Basically, when you hear the noise, lay as still as you can so the technologist can get very clear images for the doctor to read. Motion during this time will blur the images. When it is quiet between pictures, you will need to remain in the same position on the table, but it is okay to stretch or move your arms or legs until the next sequence begins. Again, the technologist will tell you before they start each set of pictures. If you feel it might be helpful, you may ask to bring a family member or friend into the scanning room with you. Many people feel it comforting just knowing someone else is right there at their side. Some patients would like a mild sedative prior to their study. With your doctor's consent, we can give oral Valium at the MRI Center. This is something that needs to be arranged ahead of time. It should be given approximately one hour prior to your study in order for it to be effective at the time of the scan. You should also have someone drive you home if we are to medicate you here. Some patients ask, "Can I try the scan without sedation, and then if I'm unable to complete the scan, can you give me the Valium and retry right away?" Unfortunately, we are not able to do that as it takes about an hour for the Valium to take effect and that would take you into the next time slot where we normally already would have another patient scheduled. If the order for Valium has been arranged ahead of time we would ask that you arrive one hour ahead. Our technologist would explain the scan to you, give you the medication, and have you relax in the waiting area until the medication takes effect. This typically takes about an hour. If you would like the sedative at home prior to coming in to the MRI Center, your doctor would arrange for you to pick this up at your pharmacy prior to your scan. You should take it according to your doctor's instructions and be sure to have someone drive you the day of your scan. If you are allergic to Valium your doctor may choose to call a different medication to your pharmacy should you feel something is needed to help take the edge off. Do you suffer from claustrophobia? Do you think you would feel comfortable having an MRI scan? Yes, I do suffer from claustrophobia and there is no way I could tolerate a closed MRI!!! scry BUT, luckily, they also have "open" MRI scanners, where you are not fully enclosed. I have had one of those and it wasn't too bad, though I was still nervous because I had to lie still. At any rate, it was definitely A LOT better than a closed MRI. 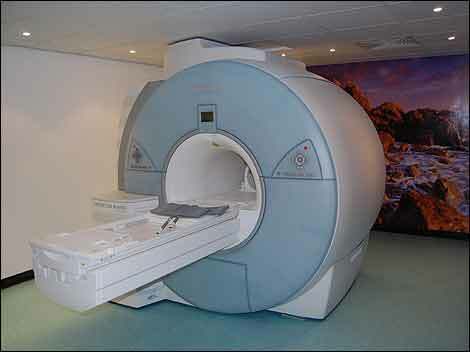 And I would really recommend anyone who suffers from claustrophobia to ask about open MRI scanners.